Joëlle has been working exclusively with porcelain for the last 20 years. She loves the whiteness of this material, which allows her to sculpt not only the clay, but also the light. She seeks to sublimate it through playing on its lightness and translucency. Her works are therefore hardly ever glazed, as glazing tends to smooth over the details and its uniform feel does not convey the full complexity of the sculpted work. 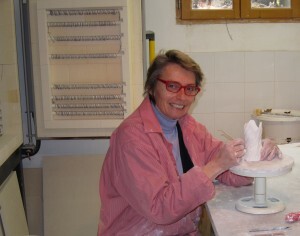 Joëlle works on a “biscuit” finish, i.e., porcelain which is fired but not glazed. She has the desire and obsession to refine a heavy, formless mass. She hollows it out, smooths it over and refines it, making it even in some places, rough and hard in others. She works on texture and light to create works that we love to look at and to touch, works that we can really feel. Joëlle Fèvre’s sculptures are true works of art. By immersing herself in the world created by SULÉKÓ, she transcends the object to create emotion, enhancing it with a touch of soul. Joëlle called on a small manufacture in Limoges to produce her creations. This family business, an expert in the art of Limoges Porcelain, has been awarded the Entreprises du Patrimoine Vivant (Living Heritage Companies) label. It works what we refer to as white gold in accordance with the high-level artisanal techniques and traditions specific to Limoges porcelain, to create porcelain of remarkable whiteness and translucency.